With spring in the air, it’s time to take a new-season look at some of our most cherished historic destinations and attractions. Come with us on a history and heritage tour of the North York Moors area – and discover a few spring surprises along the way, from hideaway gardens to yesteryear tea rooms. Spring is the time to take a fresh look at historic Helmsley, the only market town in the North York Moors National Park. Daffodils line the grass verges, flowering bulbs brighten up the lawns of Helmsley Castle and nearby Rievaulx Abbey, and birds of prey fly daily in the slowly awakening grounds of Duncombe Park. For the full spring-flower experience, there’s no better place than Helmsley Walled Garden, whose April 1 opening marks the start of the season. It’s one of the prettiest historic gardens in the UK, dating from the mid-18th century, and much of the produce turns up in dishes prepared in the Vinehouse Café, which is sited in the garden's Victorian glasshouse. 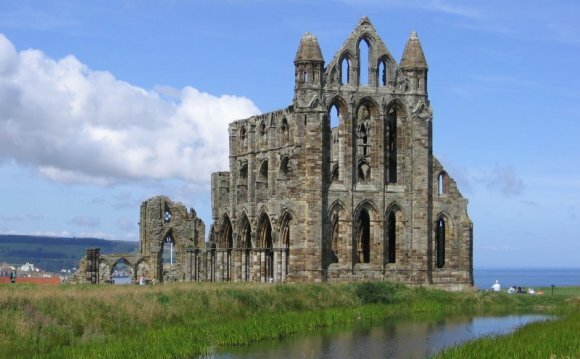 Revel in the romance of steam with a trip on the world’s most popular heritage railway line, which runs between Pickering – on the edge of the North York Moors – and the sea at Whitby. Spectacular landscapes, flowering embankments, rail-trail walks, historic halts and traditional station tea rooms are all part of the attraction on a magical journey from moor to coast. Village stops at Goathland and Grosmont offer history and heritage in abundance, while its Spring Steam Gala kicks the season off in style. After a winter spruce-up, the 20 open-air buildings of the Ryedale Folk Museum, in pretty Hutton le Hole, put their best foot forward once spring comes around again. But the buildings would just be mere timber, bricks and mortar without the amazing volunteers that bring the museum to life, and the Easter holiday sees the start of their events – from children's crafts to cottage cooking demos and novelty biscuit decorating in the Victorian White Cottage. Best of all, an entry ticket is valid for a year, so you can come back as many times as you like. England’s most imposing stately home has a thousand acres of gardens and grounds, and a spring visit shows the estate emerging from its winter hibernation. Ray Wood – one of the finest woodland gardens in the north of England – can be explored on a self-guided trail, which points out seasonal highlights among the myriad trees, shrubs and flowers. Free guided outdoor tours of the grounds and buildings also start in March, where you can discover more about Castle Howard’s architecture and landscaping.